Let the sunshine in! Taking inspiration from the city’s maritime history, this Lisbon holiday apartment is a vision of blue, turquoise and coral, all bubbling together like the beautiful–briny sea beyond. The light shines a little differently in this part of world, the sun’s soft rays cast a magical glow upon the colourful stones of the surrounding houses. Luckily for you, there’s a sea view balcony where you can look out to the city below to your heart's content. Both bedrooms have large hotels beds and both bathrooms each have pampering bathtubs. 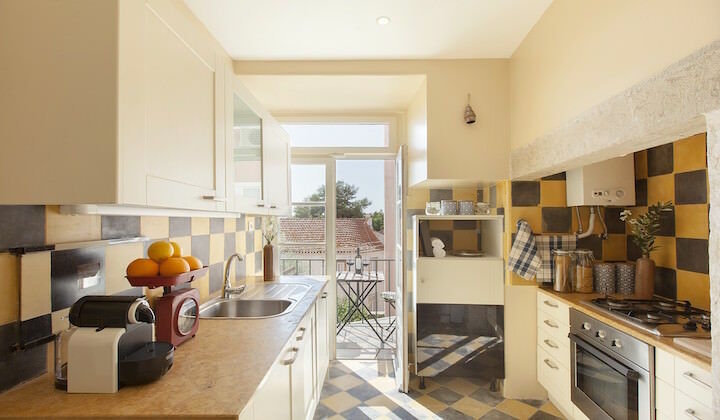 Situated in this vibrant district in the heart of Lisbon, this residence is perfect for you to experience the charm of this city. It is only a stone throw away from the most famed places in Lisbon, such as Portas do Sol, Arco do Castelo, S. Jorge Castle, Lisbon Cathedral, and various museums. You can also take a walk to the appealing area of Alfama, the historic andcolourful old town of the city.